When properly used a skilled carpenter can take a hammer and easily drive a nail deep into a piece of wood. 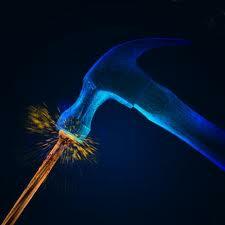 When improperly used, by a makeshift hack, the hammer may smack the nail of a thumb. While both are nails, they are designed for different purposes. When I have hit my thumbnail with a hammer, the result has been a bruised, swollen, and throbbing thumb. When people see my thumb, they make an assumption: The thumb was either hit by something or some heavy object smashed it. This is what Paul referred to as the proof or evidence of what is not seen. Even though the hammer was not present, the evidence of the hammer was clearly revealed by the condition of the thumb. Ron Rhodes makes an interesting comment about this: “Just as crime scene investigators, archaeologists, cryptographers, copyright office workers, and people who see skywriting find evidence of intelligent beings’ activity, so also we can clearly see evidence of intelligent design in the universe. Substantial evidence indicates that an intelligent being intentionally brought our universe into existence and that the universe was not the result of random chance or a cosmic accident. Such evidence serves as the primary focus of the academic field of intelligent design (Rhodes, Ron (2010-03-01). 5-Minute Apologetics for Today (p. 147). Harvest House Publishers. Kindle Edition). My Hammerology comments are closely related to the apologetics of William Paley who used the analogy of a watch and the Watchmaker. In a nutshell, Paley surmised that if someone found a watch in an empty field, that person would logically conclude that it was designed and not the product of random formation. Paley believed if this was true of the watch and the Watchmaker, it should be true of life and the universe. If a person would conclude that the intricate design of a watch requires a Designer or Watchmaker, isn’t the same true when a person considers the complex design of the universe?